The Chargearoo is a concept iPhone charging pouch that addresses a very common problem. Sometimes there is nowhere convenient to rest your phone while it is charging. This innovative design is a charging cradle that holds your iPhone while it charges. 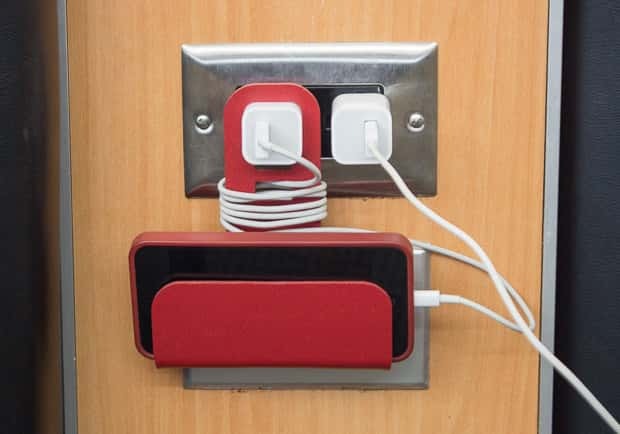 It attaches to the wall plug and provides a safe environment. This is particularly convenient if you wish to use a powerpoint that is not near a desk or anything else you can rest your phone on. It is completely portable and very easy to use. The simplest ideas are often the best ideas. Want to get your hands on one of these? Check out the project on Kickstarter to find out how.